Lucasarts seems intent to never release another game in the X-Wing (video game) series so long as I live. That’s fine. Whatever. I can cope with that now that I can clear a tabletop and play a game of Fantasy Flight’s X-Wing (the miniatures game) instead. Built on the same bones as Wings of War - in that players select moves “blindly”, reveal them then engage if they’re within range - it adds a range of bonuses and strategic options that make it a far more engaging and thoughtful experience than Wings’ 20th-century editions. If you’ve never played Wings of War, well, know that it’s about as close as a tabletop game can get to simulating a dogfight without you needing to spend half the day performing sums. It’s a game that rewards foresight and planning yet, thanks to elements of chance, is also hugely accessible and forgiving for novice players. X-Wing is set in the classic trilogy (duh), and its core edition comes with a single X-Wing and two Tie Fighters. While outmatched, the Rebel craft has is more powerful, making things a lot fairer than you’d think a 2v1 fight would be. The game works like this: players choose a side then select from a range of “power ups” that can modify the course of an engagement and thus change the course of battle. They then choose a card representing which “character” they are going to be. In my first game, for example, I went with Luke Skywalker, who had great stats but also little room for the powerups. Depending on your playing style, you can do the opposite, and select a “rookie” pilot who can bulk up their loadout with all kinds of extra gear like fancy R2 units. Once the groundwork is laid, players select a movement for their craft in advance, and in secret. Revealing your choices at the same time, you then position your craft on the table according to your selection, and if you’ve ended this phase within range of an enemy (and with them inside a “firing arc”), you can take a shot. This is where the power-ups come in. Combat is decided by the rolling of dice, with advantages given if you’re at close range and packing powerful weapons. But your power-ups can allow for things like re-rolls or the switching out of results. If you score a hit, the enemy is dealt a damage card; get enough and they explode. Once all your enemies are dead, you win. While I played the core set, which allows for 1v1 (or, really, 2v1) play, there are already expansions available which add new craft (Y-Wings, Tie Advanced) and new character cards, allowing for more players. There are also “missions” available if you want to try something more advanced than a standard deathmatch, like escorting a shuttle (sadly represented as a cardboard token and not a miniature). This game is amazing. It strikes that necessary balance between skill and luck that all good games need, but does so in a way that’s almost instantly accessible (even if you’re not a tabletop gamer) and of great interest to Star Wars fans. The extra rules and tokens applied might take a little getting used to for Wings veterans, which was a simpler affair, but they’re worth the reading, as they can help turn a game on its head in an instant. The icing on the cake, though, are the miniatures themselves. Fantasy Flight’s Wings of War fighters were worth collecting just for the sake of it, and these are no different, each craft incredibly detailed and looking gorgeous laid out across the table. That image up top? 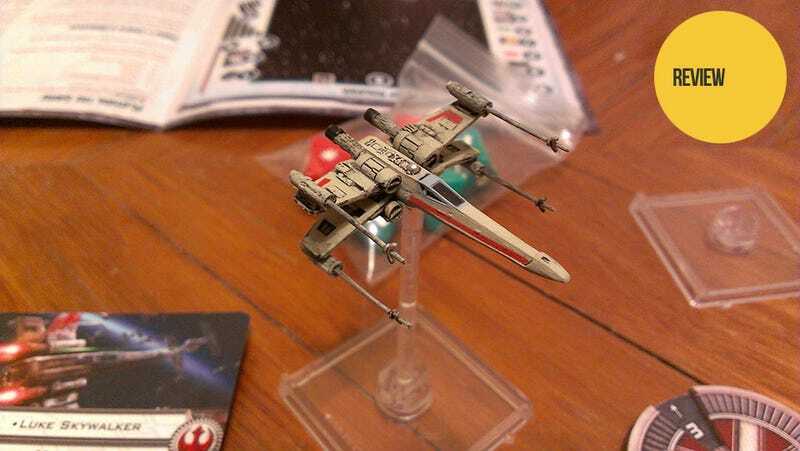 That’s me holding the game up for the 100th time just to soar my little X-Wing around the living room. About the only downside to the whole proposition is the price. The core set isn’t too bad, but it ships in an almost gimped manner, with the extra dice and at least 1-2 extra craft almost a necessity. That blows the cost out to around $60-70, which is a bit of a sting considering the core set initially seems like a bargain at $40.